Ah! I haven't written a blog post in a while. It's such a simple task but needs proper management. I prefer to just dump images all in one. So here they are! Tried honing my traditional skills with Gouache recently. I'm enjoying its combined acrylic and watercolour properties. Maybe a bit of oil too with its blending ability, but not too much. It dries very quickly. Master studies. Because you and I can. Why shouldn't we? So much to learn! They're after Sargent and Zorn. Zorn must be my favorite portrait master painter, so closely to Leyendecker, which I've yet to tackle! Last year, I delved into the hyped Inktober for the first time. I didn't get very far but it was so much fun getting back to inks! Long before I got into digital, ink was what I frequently worked with, along with colored pencils. Finally, and very recently some lizard heads. Dragons are coming! Best to all of you! Today's post will be pretty short. 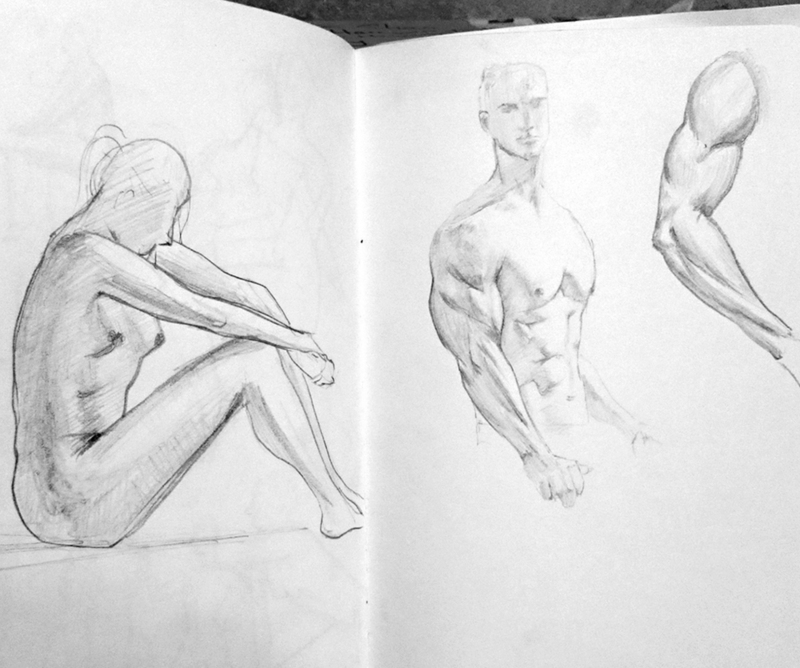 I did a couple of sketchbook drawing practice. I'm still in the process of relearning traditionals. It's taking a while.. And I'm struggling using mechanical pencils, I should really switch back to regular old wood pencils. I recently bought charcoal, a medium I have never tried, so I'm looking forward to it. Here's the summary for this week, in visual form! I'm working on a piece which features some water creatures. Can't say what it's for yet, but it's a pretty big deal to me. So I wanted to study some amphibian, preferably that of frog skin textures. The colorful one took me a while.. too much. I was trying to use the mixer brush a LOT. It dulled the colors, dulled the rendering, it looked boring. I tried to use it just to experiment a little and see if my process could go faster, clearly it doesn't work for me. I do like the minimal usage of it, especially when trying to create smudged effects, which is most attractive to soft edges. But having to use it everywhere and relying on it to do the blending for you.. doesn't work. At least for me. I end up losing the colors then I try to reapply it, then blend it again, then lose it again. No wonder it took forever. I went back to the good old method of the manual 'labor' of splashing the colors in and taking the time to make gentle strokes and blend it myself. Voila! Looked nice and bright. Think I'll just stick with this method. Some more random drawing practices. Combination of a study and imagination. A sample I made for a commission. Last Thursday I wrote a draft that was supposed to go up today but ended up scrapping it for this one instead, a study focused post. I have a tendency to cringe towards my own writing and end up deleting everything before it sees the light of the internet, akin to 99% of my tweets. It was about a long struggle feeling like such an inadequate artist and a disheartened spirit that everybody is familiar with. Perhaps I’ll save that longer rambling for another post. Below are some photo studies. I saw pictures that attracted me, they were very pretty for some reason, I wanted to know why. Some things I keep in mind and little tricks I use with studying color and light: a. Figure out the prominent colors first and immediately just put it down on the surface. b. Take note of the main forms, its shape and structure and how that affects the shadow casts. c. I'm not worried too much about tiny details, just the general silhouettes of the objects. d. Ask myself why the colors are the way they are. While studying I try to guess the colors, most of the time I found that I am almost always wrong. From there I try to figure out what the actual color is, why I thought it was another color, and how do I learn to predict the correct colors if I'm going to start an image from scratch. e. Color relations, and thinking in general temperature. How does it affect the palette and how come the palette seems limited yet able to create an interesting mix. Trad inks and pencil. Mini study of Flagg's ink work. And Paul Bonner's characters. I love his shape choices and how he makes very interesting characters. Ending it with a master study of Mian Situ. I love the pastel light colors vs. the strong subjects that creates amazing contrast. I really struggled with this one. He had a complex palette and it took a while before I figured out the prominent colors. Though the main subjects were mainly warm, as well as the front of the landscape, he managed to balance it towards on a cooler temp by using light purples and a lot of it leaning towards more to grays. I’m focusing on the essentials of human characters for now, more especially color and light, and some environment aspects. But soon, I want to tackle other subjects like materials and creatures. Very soon. One step at a time. It’s going to take a while… humans and its form are very complicated! Anyways, that's it. Bye for now!